Este sitio es para compartir un poco sobre la cultura, noticias, lugares y eventos de Ecuador. 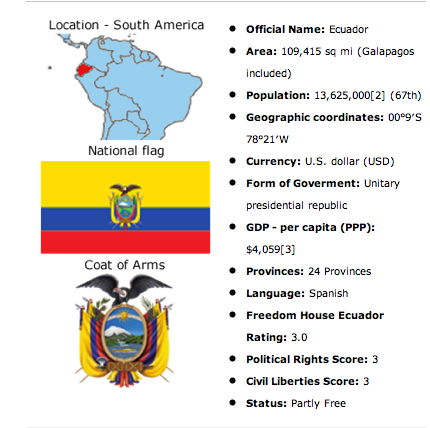 Ecuador es un lugar con mucha diversidad en el clima, geografía, personas y tradiciones. Hay cuatro regiones naturales bien diferenciadas: la Costa, la Sierra, El Oriente y las Galápagos, cada cual con sus propias características del lugar. Puedes usar el blog para escribir sobre todo que estas leyendo y aprendiendo. Espero que disfrutes! 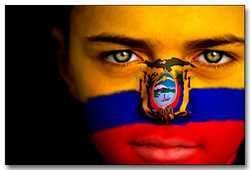 The following are some tips on how to avoid theft during your stay in Ecuador. (This information is especially helpful while you’re traveling in large cities, such as Quito).  Dress down. Don’t go out wearing expensive jewelry or watches—they make you a target.  Leave as much money as possible in your hotel/home (preferably in a safe-deposit box) and conceal what you take with you by using a money belt or a leg pouch. Keep a small amount of change in your pocket, so you don’t have to dig in your money belt for small purchases.  Make copies of your important documents, card numbers, etc., and give them to a trusted companion. It's also a good idea to leave copies of important documents and numbers with a relative at home, or store them on password protected email account so that you can access them from anywhere.  When you feel unsafe it's not always paranoia— it’s better to trust your instincts. If you get that feeling, grab a taxi or go into a place with lots of people.  Walk confidently with your head up and be aware of what is happening around you.  Like anywhere, find out where the unsafe parts of town are and avoid them.  Foreigners are required to carry identification, which you can do by carrying a photocopy of your passport. Don’t carry your real passport around with you unless absolutely necessary.  Keep all important documents in a secure place, such as an inner pocket or a pouch that is hidden under a layer of clothing.  Do not carry shoulder bags that can be easily swiped. If you have a backpack, wear it in front of you--where you can see it—rather than on your back (especially when on the street or using public transportation). Keep a firm grip on your valuables.  When in a big city like Quito, get to know it a little by studying a map before you set out: standing on street corners consulting a map makes you more vulnerable. If necessary, step into a store before you take out your map. Remember, having an air of confidence (no matter how false!) is good protection.  Be especially vigilant whenever out after dark. Whenever possible, travel in groups.  Be careful when visiting banks, casas de cambio, and ATM machines: criminals are on the lookout for foreigners going to and from these places with large amounts of cash.  Whenever possible, carry credit cards instead of large sums of cash. You can always cancel your cards but you can't get hard currency back.  Be wary of people who are too friendly too quickly, or that offer to show you around. Use your judgment and don't worry about appearing rude. Like other big cities, there are areas of Quito that you should never visit, and you should always be aware of your surroundings. You need to use common sense and be street smart. Don’t take unnecessary risks. Do not walk or take buses alone at night – especially women. Do not go into La Carolina Park after dark. Be very careful in La Mariscal,” la zona”, which is the main nightlife area in Quito. Crime has increased in this area recently, and tourists are a favorite target. The bus station in Quito is not a good place to hang out at night, or during the day. Limit the length of time you spend there. Do not climb Pichincha, the mountain on the west side of the city, alone or in groups. It’s a good idea to move around the city in groups and avoid all parks at and after sunset. Don’t pull your wallet out and start counting your money in public. Wear your money around your neck or your waist, and avoid keeping it in your back pocket. Be careful with your camera. When in the bus, trole, or ecovía, hold your backpack in front of you, not on your back. Churrasco: A hearty meal that consists of grilled meat, rice, two fried eggs, french fries, fried plantains, and salad. Llapingachos: A delicious plate typical to Ambato (but enjoyed all over Ecuador), it consists of fried, mashed potato-and-cheese pancakes (yellow in color due the seasoning annato which is used). The llapingachos are often accompanied by rice, salad, avocado, lettuce and tomato. They are definitely worth a try! Seco de Pollo: Fried chicken served with rice and often garnished with avocado. Lomo salteado: a thin beefsteak that is covered with tomato sauce and onions, served with rice. Ceviche: Seafood marinated in lemon juice and served with popcorn. It can be made from pescado (fish), camarones (shrimp) , or concha (shellfish). For those who prefer an alternative to seafood, ceviche de pollo (Chicken ceviche) is occasionally found in restaurants. Carne Apanada: Breaded meat, often served with rice, salad and french fries. Cuy: Whole roasted guinea pig. This is a traditional food in Ecuador which dates back to Incan times. Considered a delicacy and served on special occasions, it is said to taste like a cross between chicken and duck. Menestras: A hearty serving of beans or lentils served with your choice of chicken, fish or meat, accompanied by rice, plantain, and often a salad or potato. Patacones: fried, mashed, salted plantains. Chifles: Similar to the patacones in that they are also made from fried plantains, chifles are thinner and crispier, and often a little sweeter. Maiz tostado: A tasty snack found in Ecuador, made from large kernels of corn cooked in oil and lightly salted. Canguil: Popcorn (known in other countries as palomitas). In Ecuador this is often served as a snack, or sprinkled on top of soup. Empanadas: There are two types of empanadas--empanadas de sal, or empanadas de dulce. Empanadas de dulce mainly have cheese on the inside and sugar on top. Empanadas de sal are more filling, and often have meat or chicken and veggies inside. Bolón de verde: Made from plantains and round like a ball, this tasty snack often contains an array of ingredients on the inside: cheese, meat, carrot, chicharron, etc. It may be eaten as a snack or served in soup. Chicharrón: An ancient food dating back to Incan times. It is fried pork skin which is crispy and contains a lot of fat—not recommended for the health conscious.  Parque El Ejido: Patria y Amazonas. (Open Saturdays and Sundays).  “La Mariscal” District: Sector La Mariscal -- Quito's best shopping area is the Mariscal district, which has a tightly packed collection of boutiques, specialty stores and craft stands. The streets Amazonas and Juan Leon Mera have the highest concentration of stores. (Monday-Saturday).  Mercado de Santa Clara: Versalles y Marchena -- At this traditional neighborhood market, you'll find fruits and vegetables piled high, bundles of dried and fresh herbs, grains, and huge bunches of freshly cut flowers. (Monday - Sunday).